Joanna Gaines, you won. One of the biggest trends to come out of 2018 was the modern farmhouse movement, a home decor style made popular by the HGTV star. Leaning more country-cool than stuffy traditional, the aesthetic focuses on simple silhouettes in classic colors, prizing quality and material over temporary fads for an effect that’s somehow both timeless and contemporary. It’s about highlighting natural materials and crafting a calm, cozy home environment that you never want to leave. With such an accessible and ageless aesthetic, it’s no surprise that the farmhouse trend has become such a beloved one. It’s also a lucrative one: According to a report from realestate.com, starter homes with farmhouse-chic elements like coffered ceilings or claw-foot tubs sold for as much as 29 percent above expected values. One standout feature? Farmhouse sinks—the oversize style helps home sell for an average of 26 percent more than expected. This year, fully embrace the rustic trend by upgrading to a farmhouse sink. Whether you’re thinking of moving and want to up your selling price or just want something new for your kitchen, you can’t go wrong with this feature. You’ll feel like you’re living in an episode of Fixer Upper; plus, all the added space for dishes is a serious game changer. To help alleviate some of your renovation research, here are our favorite kitchens (both big and small!) where the farmhouse sink steals the show. “Boho modern farmhouse” is a thing, and Justina Blakeney has perfected it in this eclectic kitchen. Copper is a fun twist on tradition for the sink material. Okay, so technically this beaut farmhouse sink is part of artist Katie Rodgers’ studio, not a kitchen, but it’s a lesson in small-space design. A couple of open shelves perched above a massive sink (whose ledge acts as a mini shelf) more than make up for a lack of counter space. Who needs cabinetry? This setup is proof that you can take the rustic motif one step further past the farmhouse sink by installing the fixture in an antique worktable instead. Calm and minimalist was the direction for Kate Zimmerman’s home, and her open-concept kitchen is no exception. Flanked by natural tones and pared-back decor, the farmhouse sink feels more contemporary. When your kitchen features mismatched woods and unfinished textures, a country-style sink is the only solution. We’re taking notes from this gorgeous Las Vegas home. Add texture to your apron sink by opting for a model with ridges. In a setting with so many bold colors and an eclectic mix of styles, going traditional is out of the question. Marble just makes everything more sophisticated, especially when paired with matte black fixtures. This kitchen is timelessly elegant. Everything, from the standalone sink to the exposed pipe to the random ceramics on display, screams modern farmhouse, and we’re here for it. If you’re looking for a more mod take on the trend, pair your farmhouse sink with features that are decidedly contemporary. 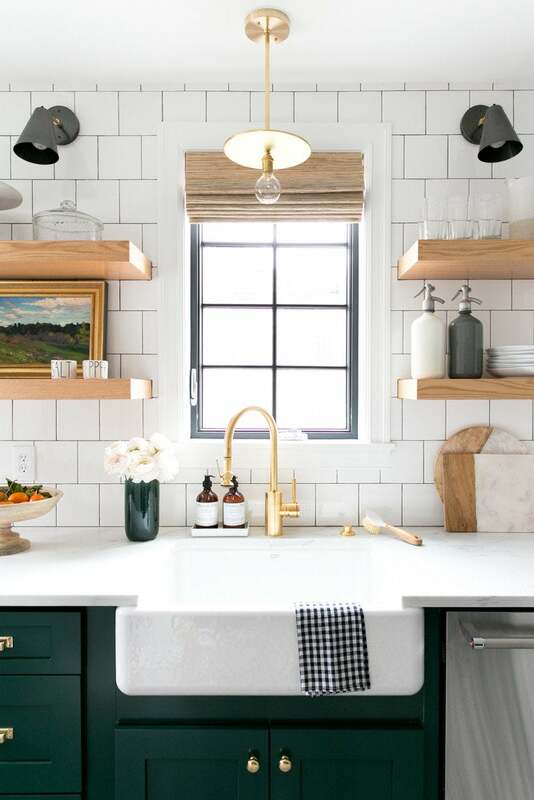 In this Studio McGee–designed home, subway tiles, brass fixtures, and emerald green paint make everything look cohesive. When in doubt, go simple. Neutral tones and timeless design (how gorgeous is the floor tiling?) perfectly complement the farmhouse sink.